Lachowitch, Eugene [Євген Ляхович] – engineer, journalist, active in political and community affairs; born on 4 June 1900 in the village of Ushnia (Zolochiv raion, Lviv oblast, Ukraine; at that time – Zolochiv county, Austrian crown land of Galicia); died on 16 October 1976 in Boca Raton, Florida, USA, buried in Boca Raton. From 1918 to 1921 Lachowitch served in the Ukrainian Galician Army. In 1922-23 he studied at the Technische Hochschule in the Free City of Danzig. There he was active in the Ukrainian students’ movement and in the underground Ukrainian Military Organisation (Ukrainska Viiskova Orhanizatsiia, UVO). In 1923 he emigrated to the USA and continued his studies at the Polytechnic Institute of Brooklyn in New York. In 1929 he became a US citizen. Within the Ukrainian community in the USA he promoted the ideology of the UVO and, subsequently, of the Organisation of Ukrainian Nationalists (OUN) into which the UVO was absorbed. In 1930-1932 he visited Galicia. On his return to the USA he became active in the Organization for the Rebirth of Ukraine (ODVU), founded in New York in 1931 by the OUN. 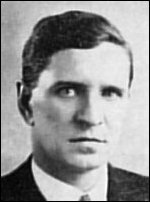 In 1933 Lachowitch moved to London as the OUN representative in Great Britain with the main aim of gaining the support of the British government for the Ukrainian national movement. Нe had frequent meetings with Foreign Office officials and presented them with various memorandums. He also contributed articles on Ukraine and the OUN to the British press. On 24 June 1935 he gave a lecture on “Ukraine and the Near East” at a meeting of the Near and Middle East Association which was attended by about 150 people. He was on good terms with the Ukrainian Bureau in London, which assisted him despite the political differences between the Bureau and the OUN. During his stay in the United Kingdom he was the London correspondent of the Ukrainian daily newspaper Svoboda, published in the USA, and he also contributed to other periodicals. In 1935 Lachowitch returned to the USA. From 1936 to 1942 he was an associate editor of Svoboda, after which he worked for a New York engineering firm until 1948. He continued to be active in Ukrainian community affairs, initially as a leading member of the ODVU. In 1946 in New York he led the founding of the Organization for the Defense of Four Freedoms for Ukraine and, until 1948, was its first president and editor of its bulletin Visnyk. He subsequently worked for a number of engineering firms in Miami, Florida until his retirement in 1965. His publications include Forma i zmist ukrainskykh vyzvolnykh zmahan (New York, 1960).